The density of the material is 1.05. It is placed on the region that will be irridiated. It corrects surface irregularities and gives a structure to the deep dispatch of a radiation dose. 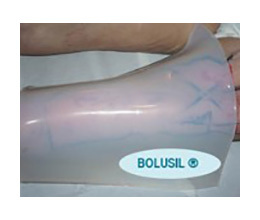 Bolusil® is placed between the skin and the source of radiation.